Southampton man Aaron Ramsey has transformed his life after completed a UKSA Change Direction course. The unique back to work training scheme gave him the self-belief, confidence and relevant experience to land a dream apprenticeship locally. 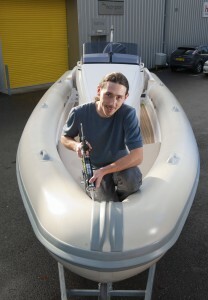 The 24-year-old from Sholing is now more than two months into his trainee workshop engineer role with Lymington-based Scorpion Ribs Ltd – class leading manufacturers of luxury and custom-made rigid inflatable boats (RIBs) and with clients like Sir Ben Ainslie. He got the job thanks to the Change Direction course, a six-week course for 16 to 24 year olds seeking to move off benefits and into employment. It included a two week residential here at Cowes made up of marine industry workshops and water based activities, followed by some four weeks of hands-on work experience back home. Over 80% of all participants to date have moved into some form of work or training. Change Direction helps build self-esteem, establish a healthy daily routine and create a positive work ethic through participation and cooperation. By removing barriers to employment it also helps participants prepare for the work place through maritime and watersports activities – using the water as a catalyst for change. Aaron explains: “I’m reasonably well educated, with AS and A Levels, but was unemployed for over a year nevertheless and with very little drive or direction, so I jumped at the chance to join the first Change Direction programme on the mainland last spring. I thoroughly enjoyed my time at UKSA and was really impressed with the facilities and how friendly the staff and other students were towards me. I wouldn’t hesitate in recommending them because the teaching style is laid back, but also very interactive and inspirational. “The hands-on Change Direction work placements were fantastic too – I had a great week at MDL Marina’s Saxon Wharf facility on the River Itchen (where I shadowed the dock master and got involved in both engineering and administration tasks), plus a very rewarding spell with Seadub Marine Engineering near Ocean Village. As a result of doing well there, I secured a week’s paid work on a luxury 31m sailing yacht, helping at the start of the refit. “I obviously did a decent job, because I secured more opportunities on other local boats doing maintenance work, and as a result of this got a further few month’s paid work at another marina – preparing yachts for the Clipper Round the World Race no less. “I loved every minute and was definitely looking to pursue a long term career in the maritime industry, so I’m delighted to land my first full-time job with Scorpion Ribs Ltd. The department I’ve started in specialises in the inflatable tubes that attach to the side and give these powerboats their superior buoyancy and speed dynamics. Kevin Hunt, General Manager at Scorpion Ribs Ltd, adds: “Due to our expansion plans and good order book, we were looking for a trainee to come in and learn the art of manufacturing Sponson tubes for the high-end RIBs we produce. But the person had to match a specific criteria – be presentable, impressionable, fit in with the existing team, show a willingness to learn, be of hard working character – and I must say Aaron ticked all the boxes. His UKSA and subsequent work experience had certainly stood in him good stead. “The work is very specialised but here at Scorpion Ribs Ltd we are pretty unique in having all the production process – which includes laminating, electrics, seating, engineering, tube manufacturing – under the same roof, so he will obtain a very broad range of skills and learn from the best in the business. We have a fantastic team here including many other apprentices developing through our well established training program.